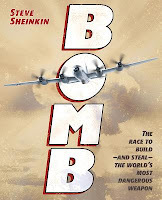 Bomb: The Race to Build -- and Steal -- the World's Most Dangerous Weapon by Steve Sheinkin. Grades 7 and up. Flash Point, September 2012. 272 pages. Review copy provided by my local library. So, you knew that the first atomic bombs were dropped on Japan in 1945, forcing Japanese surrender and ending World War II. But, um, what exactly is a nuclear weapon? And how did scientists develop it? And what was with all the secrecy? And to what lengths would the Soviets go to get their hands on scientific information about the bomb? And to what lengths would Americans go to keep the bomb out of the hands of the Germans? Bomb answers all those questions and so many more in a compelling narrative that will keep teens (and adults) turning the pages. Looking for literary nonfiction that fills Common Core Standards* and won't put teens to sleep? THIS IS IT, folks. 1. The characters. I love character-driven stories, and Steve Sheinkin turns all those major players at Los Alamos and beyond into real people. Not only does he shine a light on Robert Oppenheimer and the other physicists who are developing the bomb, he presents a balanced look at the Americans who passed secrets to the Soviets, as well. 2. The espionage. Not only were there Soviet spies trying to get their hands on American information (and Americans who helped them out), but there were Americans doing covert operations to keep the Germans from developing the bomb. Americans also spied on German scientists to try to find out how close they were to developing it. The book includes many stories of such operations and espionage, which is something I really knew nothing about. 3. The science. Sheinkin artfully explains the science behind the atomic bomb in an accessible way. You don't have to be a physics student to understand this book. (But there could very well be passages that might be useful in a physics or science class! *cough* CommonCore *cough*) I particularly liked how Sheinkin builds tension in the beginning of the book when published physics research begins to inspire scientists to contemplate the possibilities of such a weapon. 4. The back matter. Of course. You don't get to be an ENYA-Award-winning author without including awesome back matter in your books. This book includes extensive source notes and resources for further research, as well as archival photos and original documents like Einstein's letter to FDR warning him that an atomic weapon might be possible. All of these elements are expertly woven together to create one hell of an adventure story, particularly appealing to curious and thoughtful teens and for adults wanting to know more about the bomb. I'm really into YA nonfiction that has crossover ("crossUNDER"?) appeal for adults. I think YA and kids' nonfiction is a great way to get an overview on a topic you're curious about without having to read hundreds and hundreds of potentially complex and technical pages. There is so much GREAT nonfiction being published for teens and kids that there's a really rich selection to choose from. 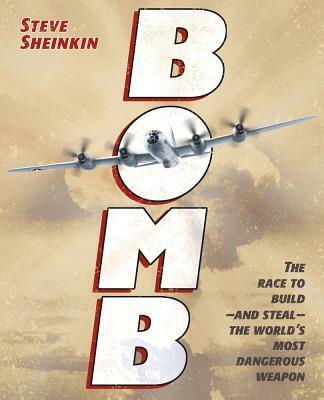 Bomb was a finalist for the National Book Award this year, and you can read another review at The LibrariYAn. Bomb is on shelves now! * My staff and I have been to several trainings on Common Core Standards over the past couple of months, and I'm so excited that literary nonfiction (which I have loved for years) is such a big part of it. I'm going to have to read this one. I liked this author's Benedict Arnold book.